This Gluten Free All Purpose Flour boasts cup for cup substitution, such as not to throw off the chemical composition of your recipes as much as reducing flour would , as GF flour is often needed to be reduced by 25%. 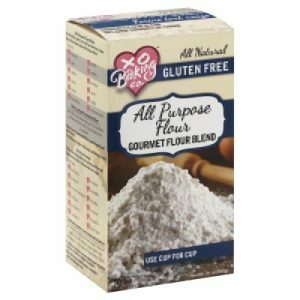 It’s a solid choice, we liked PC’s Gluten Free Flour better, however PC’s needs to be reduced. Less volume than PC’s , XO’s is around $10 for 595g vs PC’s at 800g for same price at the time of this posting. We purchased XO’s at bulk barn.